Tunnelling has now been completed on the Southern Water’s US$471M Cleaner Seas for Sussex project in Brighton following the removal of Ava Francis, the pipe-jack TBM that has just completed the 1km connection to the scheme’s already bored 11km sewer tunnel. Contractor JV, 4Delivery, comprising Veolia Water/Costain/MWH carried out the tunnelling works which included the main sewer tunnel constructed mainly through chalk using two 2.4m diameter Lovat EPBMs. 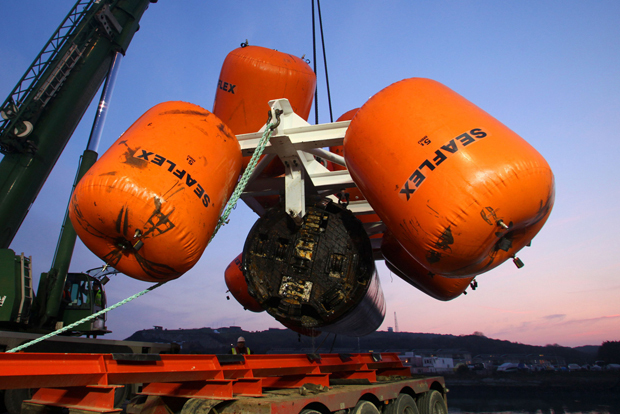 Ava Frances was lowered into an access shaft at Friars Bay at the end of 2010. Since this time she has dug her way 1km out to sea at around 45m depth, towards a reception pit located at the start of the new long sea outfall which was laid on the seabed in 2010. Using a specialist barge, Ava Frances has been lifted out of the water and loaded onto a lorry at Newhaven to be refurbished before going on to her next job. The new sewer tunnel from Brighton Marina to Friars Bay, Peacehaven, was completed last year by the Lovat TBMs Alice and Hollyblue. The project also includes a new wastewater treatment works at Peacehaven, two new pumping stations and a new long sea outfall. The new sewer tunnel will carry wastewater from the west to the new wastewater treatment works and then take the treated wastewater to the long sea outfall where it will be released 2.5km off shore. Once complete the wastewater treatment works will treat the 95 million litres of wastewater produced each day by the residents of Peacehaven, Telscombe, Saltdean, Rottingdean, Ovingdean and Brighton and Hove. Supplier 4Delivery began work in the summer of 2009 and the project is due for completion in 2013.